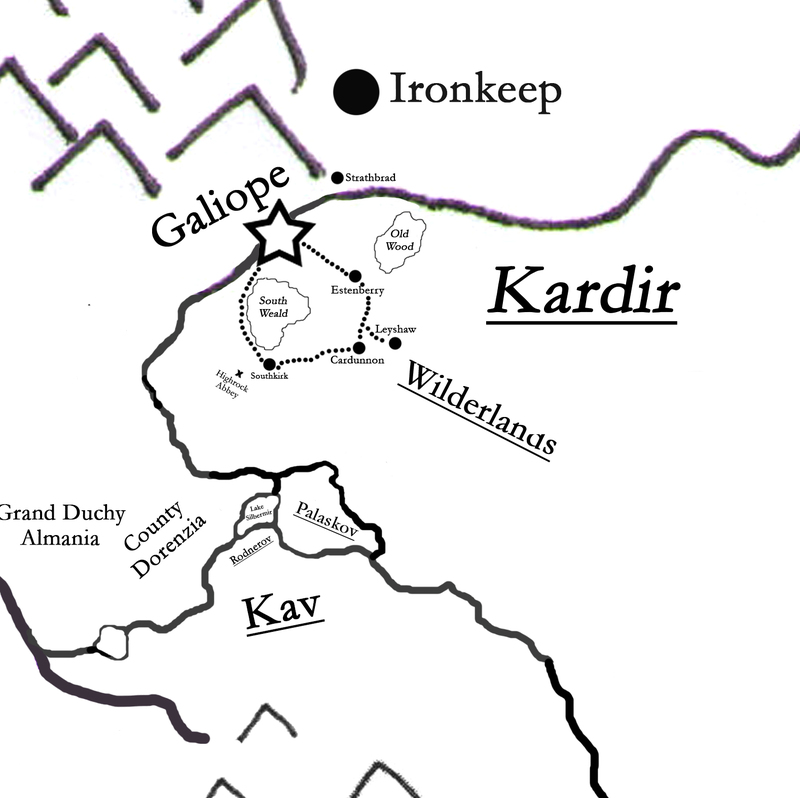 East of Zarubain and north of the lands of Palaskov and Kav lies the region of Gallia. A confluence of Getic, Wilderfolk and Zarube cultures, the towns of Gallia—united in a cohesive league—have managed to maintain their liberty from outsiders for the extent of their history. They owe this freedom to the protection of the Council of the Twelve—the Northern World’s much-feared association of wizards—which has its seat of operations in Galiope. • Galiope (pop. 40,000): The largest city and the capital of the Gallian League. The seat of the Lord Chancellor and his thirty-three Aldermen. • Southkirk (pop. 20,000): A city in the southernmost portion of the Gallian League, several miles north of the stone-walled border of Kav. The second-largest city in the league, represented by seven Aldermen. • Cardunnon (pop. 8,000): A large town in the south-east of Galiope with strong Wilderfolk influence. A few miles north of Leyshaw. • Estenberry (pop. 6,000): A sizeable town in the east of the Gallian League. The surrounding area, Estenmere, is highly agrarian and productive, and rumored as a haunt of witches. • Strathbrad (pop. 5,500): A mining town at the foot of the Dragonteeth. The surrounding region is called the Strathbrad Hills. • Leyshaw (pop. 5,000): A town on the edge of the Wildenwood. A large church, overgrown with vines, is dedicated to their patron god Herne. As with Cardunnon, the Wilderfolk influence is palpable here. More often than not they select Alderwomen rather than Aldermen. The Hag Mire: A swamp. A rumored haunt for hags and their grindylow servants. Located just outside Estenberry.